The final word in this month’s theme is idolater. 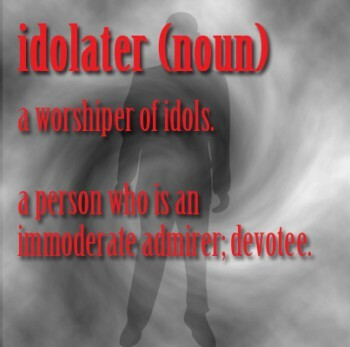 An idolater is one who worships idols or is an “immoderate admirer.” Many of us have worshiped Hollywood Idols from time to time. When this admiration has too much fervor, a fan can become an idol’s worst nightmare, leading to stalking and, in some sad cases, murder. Of course, this is not only a concern for the famous, but anyone unlucky enough to gain such a devotee. An idolater is not someone to be taken lightly. When they say they worship someone, they mean it! Think of the obsessed fan, lurking in the mist and shadows, bewitched by his idol, driven by infatuation to madness.